Update: Based on my own research into large skeletons recounted in Smithsonian reports, science journals, and newspaper articles, particularly those dating back to the late 19th and early 20th centuries, my views about whether these human remains can be called “giants”, especially without becoming associated with fringe, pseudoscientific ideas about their possible origins as a separate race of giant beings, have hardened, leaning toward greater skepticism with time. I recommend that readers please view this article, which documents more fully some of my current views on the subject. The question has long been asked: have giant skeletons been discovered throughout the Americas, and if so, is the Smithsonian Institute in Washington actively seeking to cover up those discoveries? Admittedly, while there is actually some legitimate historical information that may have to do with discoveries of this kind (which we will examine shortly), in modern times we would be hard pressed to explain why there are so few–if any–credible specimens that appear to depict humanoids of large enough proportions to qualify for being actual giants, let alone those which are kept from public view for clandestine reasons. The obvious skeptical assumption would be that this is simply because no such specimens exist. However, this lack of evidence, in the mind of the more conspiracy-minded among us, has more to do with a vast coverup than the actual non-existence of giants in ancient times. A number of researchers have argued that evidence for this can be found within a minority of “credible” cases that exist mostly in nineteenth century newspaper articles. Herein, of course, lies a big part of the problem: obviously, while we cannot rule out as hoaxes every instance where a newspaper reported the discovery of large, seemingly human remains prior to the 1930s, we must acknowledge nonetheless that journalists took much greater liberties with the facts in those days. Newspaper hoaxes were actually very common in the nineteenth century, with renowned writers the likes of Mark Twain even admitting to the use of journalism hoaxes for politically-driven satire. If anything, even the “good” reports of anomalous remains that turn up in old newspaper accounts should be taken with more than just a grain of salt. The “reports”—from old newspapers—are assumed true [by conspiracy theorists], so the fact that no such remains exist (or ever existed) at the Smithsonian is now proof of a cover-up. The claim that the Smithsonian had the skeletons of giants, incidentally, does not appear in the literature of the nineteenth century, when these giant bones were allegedly consigned to the museum; presumably, the Biblical literalists of the day would have made as much of them as they did of the Cardiff Giant, and yet it was not so. 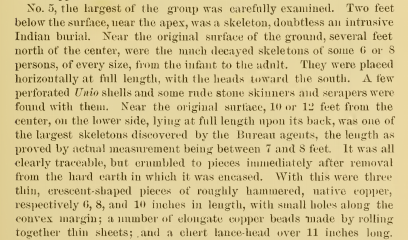 In fact, as early as 1865 the Smithsonian published a document by Ducrotay de Blainville, following Cuvier, attributing “giant” humanoid bones to mastodons. Colavito is correct in asserting that there are no indications in the historic record where large “anomalous skeletons” have gone missing from the Smithsonian. However, this does not mean that such gigantic remains were never found at all. [The University of California] seems to have misplaced the skeletons, yet the other material is still there and on display in their exhibits. The same can be said of the Smithsonian, who still use some of Loud’s artifacts for their Southwest exhibit at the National Museum of the American Indian. Again, no giant skeletons to be found in their exhibits or catalog. If 6.5 feet is a “giant,” that makes my grandfather, at 6’6″, Goliath. While unusual for their era, these sizes are not unheard of for human beings and are therefore neither shocking nor supernatural. The skeptic in me would agree with Covalito that, indeed, it is not impossible (or even all that unordinary) in modern times to find a person of similar stature to the “giants” discussed by Johns in his commentary. Maybe this wouldn’t necessarily constitute an “anomaly” to assume such persons existed in America several hundreds of years or more ago. However, debating whether the size of these specimens fits the criteria for being “giants” or not is an exercise that misses the greater point entirely: that an independent museum managed to maintain record of the remains discovered at Sunset Cave, while the Smithsonian and University of California apparently did not. Had the folks on the receiving end of this odd shipment to the Smithsonian simply been exercising extreme incompetence, or was there some other reason for the “loss” of certain parts of the shipment? This case wouldn’t have to involve human remains of large stature in order call into question why the Smithsonian would misplace portions of the batch shipment, while maintaining others for display. In other words, the mystery has as much to do with the misplacement of a discovery as it does the claims of “giant” bodies being what were actually uncovered. Also, most modern skeptics would likely look at the rather unimpressive estimated height of 6’6″ skeletons in the Pugh and Hart case, and use this as an argument against the existence of giants in American prehistory altogether. At very least, they might use it to bolster the assertion that conspiracy theorists, creationists, and the downright gullible simply exaggerate the details of “giant” discoveries, so as to cater better to the fantastic stories that such “researchers” would seek to promote. Colavito is right to assert that a 6’6″ individual is “neither shocking nor supernatural.” He is probably right again when he states that he could find no mention of missing giant bones in the nineteenth century, thus suggesting that the conspiracy assertions are a more recent phenomenon. What cannot be denied, however, are the historical discoveries of giant skeletons much larger than those discovered at Sunset Cave in 1911. Records for these discoveries still exist today, and are available in the public record, along with detailed descriptions. But these accounts won’t be found in any questionable newspaper accounts from more than a century ago, or even in the hearsay and speculation of the finest alternative history buffs. Instead, what may be the very best evidence of curiously large skeletons from America’s past were published more than a century ago by the very target of the so-called conspiracies: The Smithsonian Institute. Indeed, it seems that the Smithsonian at one time did discover and document what could only be called “giants,” during the same period that many of the American newspapers were reporting similar stories. Whether this bolsters the legitimacy of those reports may still be questionable; however, few would argue that trained scientists the likes of Powell and Thomas–despite the allegations of coverups and conspiracies–likely knew what they were talking about when they took these measurements, and reported on the existence of humans that, when alive, would easily have stood taller than seven feet. Also, it should be noted that in the latter of the two cases, it states that the skeleton “crumbled to pieces” when attempts were made to remove portions of the body. Hence, the reason in this instance for why the Smithsonian would possess no remains in their record seems clear: they weren’t able to retrieve a skeleton at all, since the discovery was too fragile to remove from the site. In other words, while the Smithsonian has actually acknowledged finding such large skeletons, there may be legitimate reasons as to why no bones were ever recovered in some instances. Of course, when it comes to good science, few would argue the difference between hard evidence, and a really good story. The 1894 Bureau of Ethnology report provides us with historical documentation by agents with the Smithsonian for the discovery of large, anomalous bones that appeared to be human, and on at least two instances. Stories like that of Sanderson and the Sunset Cave discovery of 1911 suggest the discovery, as well as the potential mishandling, of otherwise precious bits of information about ancient America. And yet, none of these “stories,” whether told by independent researchers, or agents like Dr. Cyrus Thomas, really provide us with a complete specimen: if one good, complete giant skeleton were known to exist in its entirety, which scientists today could openly study and discuss with the public, there would be little need for discussion of a conspiracy. Of course, the knowledge that such skeletons may indeed have been found at times, paired with the Smithsonian’s apparent inability to keep very good records about their discovery, no doubt helps to fuel the conspiratorial speculation. With all the unknown quantities present here (and whether they are largely fact, or merely fiction), at times it does become difficult to know whether the entire truth is really being told. Regardless, do such discoveries of giant bones that are known to have existed, as the 1894 report seems to indicate, further lend to the claims of the conspiracy theorists? Or do they merely point to a deeper level of the mystery that has yet to be explored… and something which may contain new keys to life in ancient America? Next Post: “Stop and Frisk” Ruled Unconstitutional in NY: What Does it Mean for America? When I was around 11 years old, in the late fifties, my family visited the Lovelock museum and I saw the giant skulls and the giant mummy from the Lovelock Cave. The skulls were huge, although they had been seriously burned. The over 8 foot mummy was very well preserved, including roughly woven clothing. The shaggy hair was a faded brownish red. The face was hideous and looked as if it may have been smashed in by a club. Most well preserved were the huge hands. I clearly remember the perfectly formed nails, small hairs in the pores and dried skin. I’d seen Native American mummies in other museums, but one look like at this giant and I understood why the Shoshone said they wiped them out. Because there are organizations that are Extremely powerful and wealthy that keep all of this knowledge to themselves. Were not supposed to know! This is a VERY interesting article! Uncultured and backward as I am, I have never really given any thought to the idea of ‘giants’ having actually existed, save for perhaps isolated groups whose average stature was 5-6″ greater than usual for a population (short-lived genetic or environmental anomalies). The idea of a Smithsonian cover-up never occurred to me, although it seems plausible – scientific culture has a way of squashing alternative viewpoints before they can gain acceptance, probably for the sakes of ego and funding. One thing I’d like to mention, however, is the error in assuming that the title ‘scientist’ automatically means that one cannot tell a lie, or even mis-interpret. My dad has degrees in both archaeology and anthropology, capped by a less human-centric focus on soils and natural systems. I trust him to tell the truth (aside from the occasional exaggeration for a good story), but I do not necessarily trust all of his sources, because researchers, same as newspaper columnists, live by their word and need to maintain an audience in order to get paid, whether that audience is internal (as with dry, behind-the-scenes academic research), industry-focused (e.g. supporting the interests of an oil firm whose donation might mean a brand new super-fancy million dollar piece of research equipment), or external (the general public). Moreover, science is typically more about proving than simply observing, because humans always have their beliefs and it is natural, even inevitable, that we seek to validate them. Even in observation, we must be looking for something to find it – patterns don’t pop out to us unless we can imagine them in the first place. We tweak the data around, adjust the ranges of our sensors, speculate and brainstorm, until a pattern begins to emerge in our minds. Then we’re on to something, and we tweak some more, homing in, crafting facts with imagination as fuel. But who is to say that a little more data manipulation might not lead us to different patterns? The scientific community? Industry? The general public? Ourselves? Next summer I would love to go out and see for myself some of the remains!!! Interesting article. How do we know if perhaps these so called giants might not have been the remains of sasquatch? I realize that it might be far fetched, but, bear with me for a moment. Large human remains being discovered might just fit into the bigfoot model. The long standing complaint that no bones have ever been found might just be untrue. If Sasquatch are hominids as has been purported of late is it not a possibility that large human remains of these giants were overlooked in 1880’s? You claims to be “uncultured or backward”, I beg to defer ! Your remarks are definitely worth the read and it continues the discussion in a very interesting manner . Thank you. There is a brief collection of old newspaper articles which describe the alleged excavation of strange human skeletons. Thanks for taking the time to reduce this rather tumultuous subject to (at least) smaller waves. It was kind also of you to acknowledge Colavito’s opinion, although I don’t think that gentleman is interested in much more than sensationalism and, in hindsight, to the negative. He intentionally misinterpreted what you had to say because that is his modus operandi. he too-often twists the words of others to serve his own advantage. Also, you were smart to consult with Jim Vieira, Micah Ewers, and Hugh Newman: they possess to date the most thorough and comprehensive collection of accounts on the taller stature. These accounts are growing, practically daily. Another thing I wanted to say to your favor is that there truly is a much deeper mystery underlying this whole extra-large skeletons conversation. That asks the question: if these people existed as village heads, medicine workers, and combat experts, where the heck did they come from? I cover that in the book A Tradition of Giants that anyone may download for free from the website Academia.edu. We’ll get to the bottom of this some day. Thanks for taking time to share this information! Great to hear from you, and of course, I try to be respectful of all people’s opinions… even if they twist my words so as to make them seem the complete opposite of what I had actually written, as Colavito did (though I don’t think he meant to, in fairness… I feel he was blinded by the fact that he’s so used to attacking “fringe theorists” that he presumptively tossed me in with others whose ideologies he was more familiar with). I visit his blog frequently, in truth, and often agree with his fundamental points. I disagree strongly with his tendency to be excessively harsh to the point of rudeness; nobody enjoys having to cut the snark with a half gallon of water just to be able to see through it well enough to read the rest of his post. Another issue seems to be that he reads too much into things certain researchers have said, and then alleges rather extreme viewpoints (his favorite is to call them “racists”). I think JC is capable of a better argument than that, with his obvious intellectual prowess and vast knowledge base. It’s a shame that this sort of an attack has become so standard for him… I agree that it is an accurate assessment in some cases, but in others, I think it is fair to say that this approach does little more than to highlight the fact that he could come up with no better argument against his opponents and their views than to allege something that may not be true at all, and with full knowledge that it will superficially devalue the positions of the writers he chooses to critique in the eyes of his supporters. Speaking of rude, I’d better wrap it up for now, and kindly address the ridiculous comment by “Dewane” posted below… thanks again, Ross! What I find so intsereting is you could never find this anywhere else. Wow, just all respect for the systematic scum bag LIAR you are, of course there has been 100 % PURPOSEFUL COVER UP. 3) you are part of the coverup yourself, and thus are just having fun with me. I doubt, unfortunately, that it’s a joke, or that you are part of the coverup of which I don’t support the existence… Perhaps (and this is getting really speculative here), but maybe I could have traveled back into time, and forged the papers myself, knowing they would be added to a government website more than a century later. My apologies, I’m just having a little fun here. Getting serious though, I have a question for you: how have I “lied”, as you have accused me of doing? Were the pages from the Smithsonian’s own archives not good enough “evidence”? It’s a bit unsettling when anyone just comes out of the woodwork launching allegations of “scumbag” and “LIAR” as you have, while acknowledging a “100% PURPOSEFUL COVER UP” that you haven’t offered any evidence of for yourself. I won’t attack you or be snarky for this. But in fairness, I will issue a challenge: I’ve offered my thoughts (both here, and in other articles on this site, as well as on other sites like http://www.MysteriousUniverse.org). If you disagree, find proof of the coverup, and post it here, or perhaps on your own blog or website, and craft a fair, well-written rebuttal. I always encourage people to have opinions, and to speak them strongly… but for your opinion to have any merit, there must be facts behind it too. Take care Dewayne, and best of luck. I tip my hat to you brother. Your response to this is a breath of fresh air. It is always nice to see someone respond to rudeness with diplomacy. I sometimes feel like there is to much eye for an eye rudeness involved in the paranormal community. accepted paradigm continues to the present. If it were only a couple of instances of disappearance/cover up, I would be inclined to accept your premises. Its not the case. It extends into the thousands. Scientific Revolutions”. I would go so far as to say, anyone who hasn’t digested the concepts introduced by Thomas Kuhn isn’t a scientist. Anthropology is a bankrupt science. The sooner this is realized, the sooner real progress will be made in understanding our origins. The double row of teeth is quite interesting to me as some Bigfoot sightings, where the witness is very close to the Bigfoot, have reported double rows of teeth and 8 – 10 feet tall. So people say if there is a Bigfoot, where are the bones? There are about 2,000 cases where giant bones have been found in the U.S. alone. Over 5,000 Bigfoot sightings in Russia alone..
I’m wondering could really large people or giants have existed say in the sizes from 10 feet to say 15 0r even 20 feet tall ? what would limit the growth of such people I’m talking in the 50,000 year or older range when the atmosphere was denser when even animals and insects were larger ? some legends speak of these giants and some say that there is truth to most legends I’m just asking great article BTW. The Pyramid Construction is recorded by ancient egyptians. I have a question, of the size of these giants that have been found what was the tallest ? and would there have been a limit to how tall they could have been as there were some pretty large animals around in the past. That article you linked from the http://www.vortexcourage.me website, was originally carried by “World News Daily Report”, which is a satirical website, as stated in the disclaimer they feature at the top of their page. Sadly, these days we have to be extra-careful, since there are a lot of sites like this that are presenting satire like this that is rather vaguely presented as though it were real news; and when copied and re-posted at other blogs in this way, it can become easier to misunderstand that it was intended as a parody. How about skelitans found in Turkey over the last couple of years?? I personally did my own research for Texas and New Mexico newspaper articles and was amazed. Others have also verified some of the ones I found. We suffer from the same claim to fame as the people did in the 19th and 20th century. you are ALL doing the same thing, I see misinformation on the same page.. The bible is not the source of bad information, merely perception that GIANTS means different things to different people. Clearly the numbers do not lie, I ONLY see “between 7 and 8 feet in length” skeletons found, but some of you keep embellshing this number and it keeps growing..
Now its up to 9 feet, which is complete BS, no bones were EVER found to be longer than 8 feet, even this SAME article that attracted attention for this commentary states as fact as well. The NEED to be heard or acknowledged FAR exceeds truth, that’s what you people need to understand. People will lie cheat and steal their way to fame and fortune that has NOT changed in eons.. its clear JUST from the comments on this page! I see newspaper (again JOURNALISM) articles claiming these stories as “fact” its the same rheteric that snake oil salesman used, the same BS you find in the advertisting section of popular science and jack in the box I remember reading as a kid..
Xray glasses, floating cars.. NONE of it was true it was ONLY to get you to BUY their stuff.. you cannot trust ANYONE when money is involved (newspaper) because they want to SELL a newspaper.. I have only one question, and hopefully this will put this “giant” garbage behind us.. Why has the scientific community NOT discovered bones RECENTLY? Eh? Because we have technology to refute ALL of it.. test the bones for authenticity, which is why Loch Ness or Sasquatch has EVER been (nor will be) found.. people try to make things LOOK real for the purpose of fame.. well they found fame.. just for being “fake”. A “giant” by 1900 standards is a 7 foot tall man, hell even by today’s standards that is pretty tall, I am 6’1″ and I work with 2 people that are 6’11” and 7′ tall, that’s HUGE, they look “monstrous” standing next to a petite 5’2″ woman..
That’s what YOU need to understand, PERCEPTION it’s all a matter of point of view.. from a 5’2″ frame 7′ would be GIGANTIC (hint hint).. then stories spread because THOSE people never came across anyone taller than maybe 5’10”.. which still would be pretty tall.. So the bible does mention giants but we have NO concrete figures.. only terms which are ambiguous at best.. “giants” means different things to different people.. it doesn’t mean that we compare Shaquille Oneal (who is 7’2″) to them making them bigger.. So these stories while entertaining are simply matters of perspective and not SCIENCE, a newspaper is HARDLY a good source.. I remember an article RECENTLY made the WORLD news, regarded as fact and was PROVEN a lie and this is 2014..
Now use this same logic 200 years ago to people that didn’t have knowledge or understand of technology.. to THEM it SEEMED logical people can exist but they did NOT.. so take it with a grain of salt. There are no “giants”.. of bibical proportions.. only LARGE stature people which are more common today..
Genus book or world records, the TALLEST human was 9’1″.. ever recorded.. so it IS possible in the modern age to be VERY tall.. but out of 6 billion people we have 1 person EVER proven to be taller than 9′. One last thing, if the population of the world was say 1 billion 200 years ago.. we should have MANY more bones than just “dozens”.. that to me says ONE thing..
Giants did not ROAM the earth only TALL, disproportionate people, so the bible says “giants” stop embellishing the truth.. there are no numbers to support what a “giant” is but if they DID exist surely the Smithsonian would be MORE than happy to display them, there is no “conspiracy theory” to keep this information secret..
That’s just complete and UTTER non-sense, you can’t keep those secrets.. IF they are real.. to yourself.. information like that would be spread quicker than you can quell it, I assure you. Why are there NO numbers in the bible or anywhere else but people ASSUME the proportions so they default to “giant”.. Noahs ark, great example 450 long.. yeah go measure ANYTHING now measure LIVING space.. how big is a football stadium.. it’s MUCH bigger than the field.. and the field looks small by comparison. The ark was big and for 2000 years old was probably the largest thing on the planet, but 450 feet by 50 feet by 30 feet is HARDLY enough living space (100 feet by 30 by 20) to do much with..
Be realistic and KNOW the FACTS don’t assume, numbers are left out of the bible mostly because it doesn’t matter, the BIBLE job is not to be a FACT and FIGURES book or a historical accurate time line, it’s to SHOW love and represent what WE can do as a people and you people bicker over stupid stuff, not even the point. Don’t analyze everything look at the ENTIRE story of the bible as a WHOLE don’t nit pick. This isn’t a religious discussion but someone DID mention it. Giants are only real to a point, they don’t need to be 20 feet tall (david vs goliath) to understand the POINT of the story..
A giant thank you for the intelligent and rational explanations to the giant myths. Some measurements of height are given in the Bible. You are right, this is NOT a religious issue, and those who reduce all their arguments to religious arguments are limiting their scope. It is a scientific and human issue. I am posting this in July 2016, after the Supreme Court ORDERED the Smithsonian to reveal that it DID destroy hundreds, at least, of skeletons of giant proportions: yes, larger than 8 feet, even more than 10 feet in some cases. I would like to say that all of you people who are always so skeptical are no better than those “conspiracy theorists” that you look condescending upon. At least they keep an open mind. I think that when you start to think that the only truths are those that you hear from mainstream sources, and you always trust your leaders and politicians and even mainstream science sources you are showing your gullibility and lack of independent thought. The earth, and the living things on it, are more interesting than we gave been told. Our own history is more interesting than we’ve been told. If you have to ask the question, “why would they lie and cover up?” then you are already showing a lack of understanding of human nature. Scientists all throughout history have engaged in the worst form of corruption, usually against competing scientific theories…it has been brutal. People’s reputations and lives have been ruined just because someone else’s pet theories and reputations are in danger because of new discoveries. Humans lie. Humans with something to lose are MORE likely to lie than anyone else. And just because they are a “scientist” doesn’t make them immune to being a lying, prideful, arrogant, power-mad human. You’ve brought an amazing piece of history in from the cold. And you’ve had the guts and integrity to lay it bare. I became interested in the “giant skeleton” so called conspiracy as a sideline to another fascinating series of news articles I was attempting to authenticate. I am curious, have you, or any of your followers, read about the Santa Barbara skulls discovered by anthropologist J P Harrington in the 1920’s? He was actually employed by the Smithsonian at the time of the discovery, and the gist of the articles maintained that the skulls were neanderthal-like in their measurements and general appearance, thickness etcetera, and were dated back to at least 25,000 years in age. After several months this story just kind of quietly disappeared, and Harrington went on working for the Smithsonian, albeit in the capacity of an ethnologist focusing on preserving native languages, which was his true passion. The Santa Barbara skulls are also missing, strangely enough, although some good photos exist. Sharon, do you have a link to any of those photos? I had an interesting conversation with an elderly women while in a waiting room. She told me that as a young girl, her father had some land in or nearby Snowball, Arkansas where he’d built a cabin for them to live in. I related that I used to explore the ozarks and particular enjoyed cave exploring. She lit up and began telling me of how they had a cave on their property and had found several large skeletons inside. She remembered hearing they were just over 9 ft tall. I asked her where they were now and she said her dad had called “officials” and the skeletons were collected and taken away. She said her dad called several times to see what had been found out about the skeletons but was unsuccessful in getting any information. He eventually gave up. While this story may “hold no water” for many, if not most of you, this woman was not a “teller of a tall tale” but a relayor of a personal account of her experience finding giant skeletons. I believe her and I am a normally a skeptic.